PORT MOODY, BC – Moody Ales and mobile canning service West Coast Canning have announced details of a new collaborative mixed pack featuring “two beers that celebrate the crazy awkward hard to predict weather we get on the west coast during the transition from winter to spring”. Still Raining is a Dark Lager with roasted malts giving it rich aromas of chocolate and coffee, but don’t let those fool you… this dark lager is smooth, crisp, and extremely crushable. With these in hand you will forget that it’s still raining. Shorts Weather is an easy drinking India Session Ale boasting a citrus and grapefruit punch. A hoppy beer rounded out with a sweet backbone that brings it all together. Shake off your rain jacket and slip into some swim shorts with this perfectly balanced session ale. Both beers were simultaneously packaged today at Moody Ales using two of West Coast’s canning lines, and the mixed packs as well as kegs will be released the week of March 26th. An official release party will be taking place at the brewery on Friday March 30th starting at 5:00 PM. 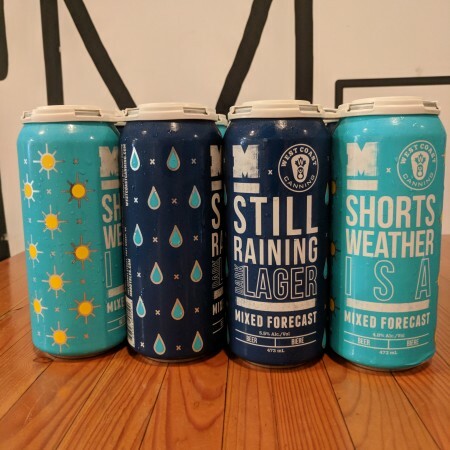 Still Raining and Shorts Weather are the first in a planned series of collaborations between West Coast Canning and breweries it works with in British Columbia and Alberta. Each release will also have a charitable component, with partial proceeds from the Mixed Forecast package to be donated to a youth related charity in the Tri-Cities area.